It’s no secret that improvisational acting (improv) classes at The Upfront Theatre have improved my self-confidence significantly over the past three years, but I still have a way to go to keep insecurity from rearing its ugly head. To become a successful author, we must be able to talk to anyone about our book, and not only talk, but sell it. Pacific Northwest author and friend Kim Kircher has blogged about her struggles with self-promotion during her recent book tour for her memoir, The Next 15 Minutes. Experts propose a variety of suggestions on how we may overcome our fears, but most of them boil down to plugging our nose and jumping in with both feet. The simple act of surviving leads to a sense of accomplishment, which incrementally builds self-esteem and confidence. Getting on stage every week and writing this blog is me jumping in with both feet. To further that effort, I opened my mind to other new experiences as well. Believe it or not, I recently worked as an extra in a rap music video. While that may not sound like a natural fit for a suburban mom and environmental scientist, the fact that it was outside my comfort zone was exactly what I needed. Below is the video itself, Take My Pain Away by Conceit, directed by Darkheart Visions Production’s talented Domenic Barbero. Although not appropriate for children, the song is stuck in my head. For most of the video shoot, I just focused on not screwing up, but I also drank in the new experience. What if I want to write fiction someday about a musician, or a video extra, or a film maker? This experience, one that none of my fellow 2nd grade moms would consider in a million years, was not only potential research for some future opus, but also a way for me to chase down my own insecurities with a baseball bat. Articles I’ve read say that extra work is so small that it shouldn’t even appear on an acting resume. But I feel like shouting about this from the roof tops. “Hey everybody, I was scared to death to appear in a music video and I did it anyway!” The experience also brought other unexpected benefits. I met some very interesting, smart, confident, and (of course) beautiful people and learned a ton of tiny details about video production, acting, and especially fake blood (Thanks Langley West!). This past weekend I also auditioned for the Upfront Theatre’s mainstage ensemble. Although I didn’t get a call back this time, I was proud of myself for having the courage to try. I stayed calm and positive during the audition process, and I wasn’t too hard on myself afterward. Shutting down my inner critic was a huge step for me. I came away from my audition with a clear list of what I need to do next time to really shine, and also gained a completely unique experience that most of my friends would never dream of attempting. Who knows, maybe this experience will appear in my next article, short story, play, or manuscript. In this article (Thanks Sandi Pants! ), The Office’s Jenna Fischer suggests working as an extra, or background artist, as one of the best ways to get started in the entertainment industry. Her random early experiences connected her to the people who years later cast her on The Office. We can’t know with certainty what our future will hold, but the range of possibility is much smaller without the inspiration of fresh experience. So the next time the insecurity monster shows up at your house, consider grabbing him by the arm and dragging him into your new experience with you, head first. Despite Amazon ratings and on-line review scores, it’s very hard to tell how many books have actually been sold. One friend had read that a person must hear about a book three times before they buy it. Everything I read and hear says that an author doesn’t know how many books they’ve sold until the check arrives in the mail from their agent. 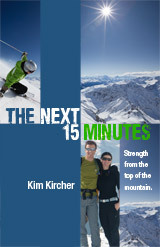 My friend Kim Kircher is in the middle of her first book tour, selling her memoir about how her life as a ski patroller, EMT, and explosives specialist helped her through her husband’s liver cancer and transplant, The Next Fifteen Minutes. Kim is wisely doing readings at ski resorts all over the country, with a few ski shops and other venues thrown in. Her recent blog post seems to be saying that she’s accepted the not knowing and is thankful to ski at each of the beautiful mountains to which she’s schlepping her books. Another friend, Royce Buckingham, just returned from a reading of his Demonkeeper series of middle grade fantasy books in Napa, CA. I hope he soaked up a little extra sun for all of us pasty Pacific Northwesters. So while the verdict is still out about whether book tours still sell books, my friends are making the most of it by going to places they enjoy and sharing their love for the written word with whomever is there to listen. Please check out their books and tell anyone you know that might be interested. Maybe book tours do sell books, just not in the direct way we were thinking. “The Next 15 Minutes” is Almost Here! As you know, I love to blog about other writers and their journey toward publication. A good friend of mine from Seattle, Kim Kircher, has an exciting memoir coming out Oct. 1, called The Next 15 Minutes (Behler Publications). I’ve enjoyed living vicariously through her writing success and am so excited to see this book on the shelves and glowing back at me on my friend’s Kindles. Kim is an EMT, Ski Patroller, and Avalanche Control Technician (the person who actually carries the bombs around) at Crystal Mountain. She writes about how she was able to use her work experience to survive her husband’s liver cancer and subsequent transplant. Her husband John, now thankfully about four years post-transplant, is well-known in the ski industry. His family opened and still operates many ski areas across the country, including Crystal and Boyne Mountain in my home state of Michigan. Kim also happens to be diabetic and trains avalanche dogs in her spare time (for all my dog loving friends). She’s a truly amazing person. I’ve been following Kim’s blog that covers everything from ski bumming, weather, and travel to family, relationships, and writing since it began. I usually come away feeling inspired and educated, no matter what the topic. I can’t wait for January when my book club will be discussing her memoir. Kim has graciously offered to attend or Skype with us! I was also grateful to have Kim by my side when we presented our workshop this summer at the Pacific Northwest Writers Association Conference. If you want to be inspired by personal strength and heroism, or you’re just excited by an insider’s view of the international ski world, check out her blog and book. The memoir will be in stores Oct. 1, but you can get a ~$5 discount by pre-ordering now on Amazon. Please tell all your ski friends, anyone struggling with a cancer diagnosis in their family, or anyone drawn to real-life adventure because they will find it all here. And most importantly, let me know what you think!